We will be closed on Saturday, April 20th for Easter Weekend. Sorry, we do NOT support or repair smart phones or tablets. available to our customers. We are sorry for the inconvenience. 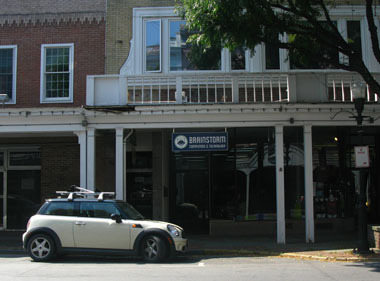 Brainstorm Computers and Technology is a full service computer repair shop – and then some – located in Uptown Kingston, NY. Hardware: Laptops, Desktops, Towers, Media Centers – Built from Scratch, Upgrades, Repairs. Software: Virus/Spyware Removal. System Cleaning. Problem Troubleshooting and Repair. Networking: Wired and Wireless for Homes and Offices. Customers can, for a small hourly fee, use our fully equipped workstations for everything from Internet browsing to complex graphic design. We are also excited to offer our Do It Yourself Workspace! If you are into fixing your own equipment but lack the space or tools we can help. We provide a quality work environment with access to tool, spare parts and help from our technicians. We also have a 40-Watt Laser Engraver on site that can etch and cut almost any material including wood and acrylic. The project possibilities are endless.